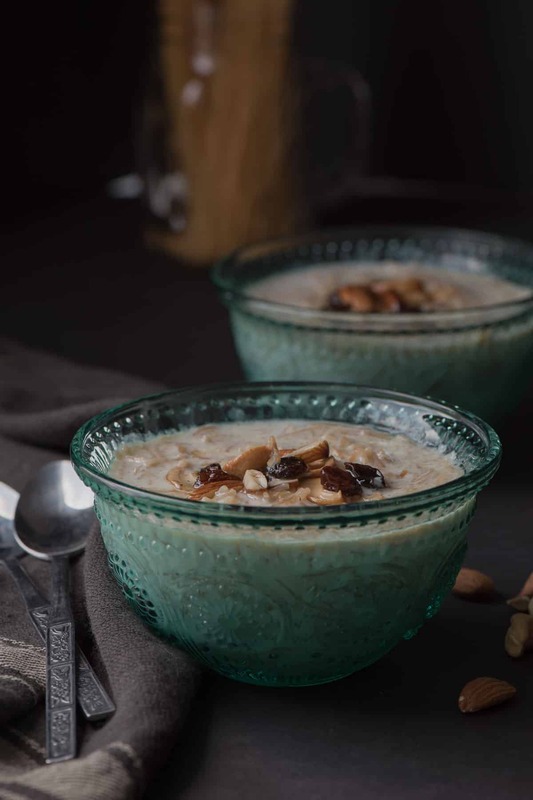 Seviyan kheer or Semiyan payasam is a creamy and delicious dessert that you can put together in a cinch. That is why it is perfect for potlucks. Make it in an Instant Pot or a slow cooker and all you need is less than 5-minutes of prep time. What is seviyan kheer or semiyan payasam made from? Kheer or Payasam or Payasa as they call it in some regional dialects is typically made of milk, sugar, and rice. In some regions, they replace rice with either vermicelli or sooji (broken wheat). This recipe of semiyan payasam or vermicelli kheer makes use of sev or vermicelli that’s made of wheat semolina. Most commonly served during festivals or as offerings to God in temples. I am not sure what’s the best aspect of this dish – it’s mind blowing taste or the ease at which you can make it. The recipe to make it is so simple that a Caveman can do it, seriously :). 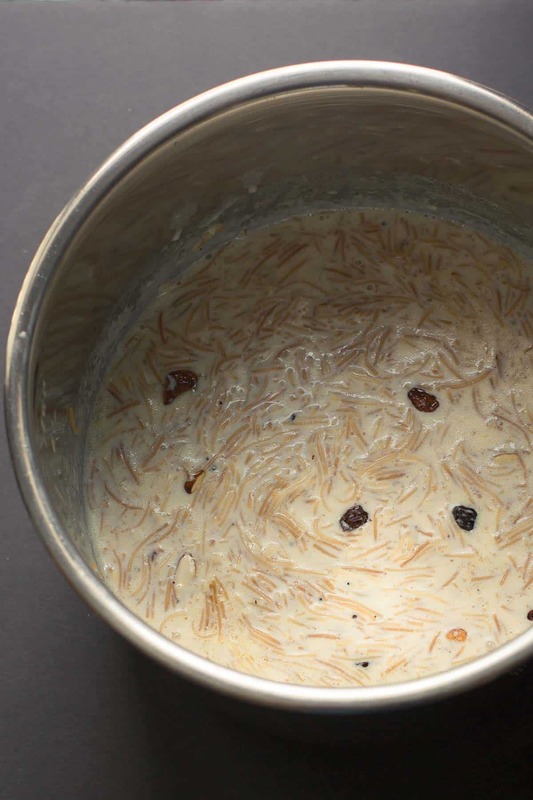 How to make seviyan kheer or vermicelli kheer in an Instant Pot? Interestingly, this was one of the first recipes that I made using my Instant Pot. I am also going to provide instructions on how to make it on cooktop as well but if I had a choice I would make it using Instant Pot or a slow cooker because you don’t have to flex your muscles to get that creamy,slow-cooked taste. Set up your Instant Pot as per the instructions manual. Add milk and condensed milk (if using) in the steel insert and mix them till they combine. Add sugar and sev and fold them in. Cover and choose the slow cook option. Set it in the "More" mode. Adjust the time to 2 hours 30 minutes. As the cooking cycle comes to an end, soak saffron in a tablespoon of warm milk for 4-5 minutes. Once the kheer is cooked, heat ghee in a pan on medium heat, add cashews and when they start to turn light brown, add raisins and almonds. Switch off the gas when the raisins start puffing up. 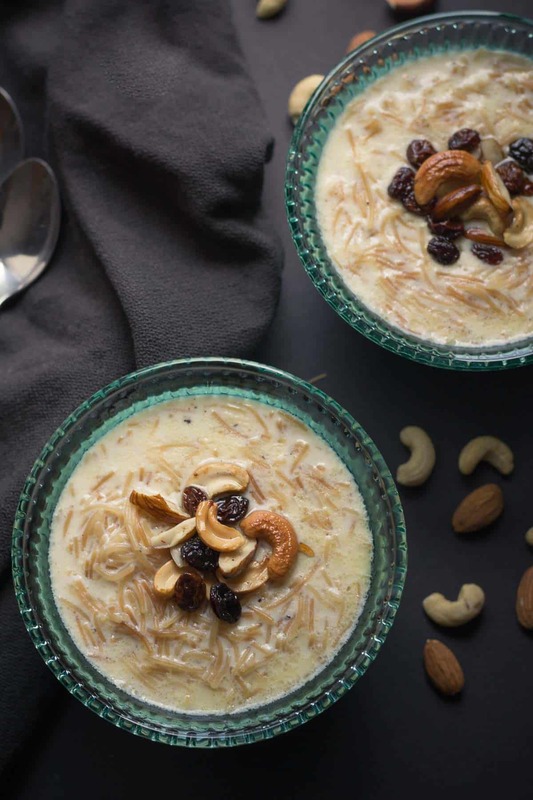 Garnish kheer with the roasted nuts, cardamom powder and saffron (if using). Set up your slow cooker as per the instructions manual. Add milk and condensed milk (if using) to the bowl and mix them till they combine. Cover and cook on high for 2 hours 30 minutes. Combine milk and condensed milk (if using) in a deep dish wok/kadhai and bring them to boil. Reduce heat to medium-low and add sugar and sev and mix well. Stir continuously until the milk is reduced to the consistency desired (10 - 15 minutes). Switch off the heat. Soak saffron in a tablespoon of warm milk for 4-5 minutes. Heat ghee in a pan on medium heat, add cashews and when they start to turn light brown, add raisins and almonds. Switch off the gas when the raisins start puffing up. I have used roasted vermicelli instead of roasting them on my own - saves time. If you can't find roasted vermicelli where you live, heat teaspoon of ghee in a pan on medium heat and roast the vermicelli till they change color (almost light brown). To make it even more flavorful, you could roast the vermicelli (even the roasted variety) in a tablespoon of ghee before introducing it into the milk. Also, using condensed milk makes it creamier. If not using condensed milk you may need to increase the amount of sugar by a tablespoon (or as per taste). 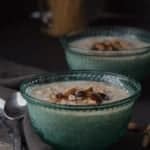 Once refrigerated, the kheer will thicken - add milk (as needed) to get the consistency you desire and reheat the kheer mixture on your stovetop or microwave. Add sugar if needed. Before you leave, make sure you follow me on Pinterest and pin this recipe to your board to make it in the future. Affiliate Disclosure: I am grateful to be of service and bring you content free of charge. To do this, some of the links on this post are affiliate links, which means that I may earn a commission (at no cost to you) if you click on the link or make a purchase using the link. I only recommend products that I use and love myself, so I know you’ll be in good hands. Your support in purchasing through these links goes towards maintaining this website. Thank you.